Though the boys were genuine in their commitment to R&B – Keith later said “The band's entire goal was to be the best London Blues band" - they'd already made the usual compromises in search for chart success. Their second single, “I Wanna Be Your Man,” was a Lennon-McCartney composition, written for Ringo to sing, and their third, “Not Fade Away,” was a Buddy Holly/Norman Petty song. On this album, however, they were free to record material from their normal club repertoire. In spite of some negative reviews – Mike Nevard of the Daily Herald wrote: "Their singles have a strange appeal, but the LP is a stinker!" - by the day of its release the album had sold 100,000 copies in advance orders, and was soon on its way to the Number One spot. However, though Oldham was quick to claim “the public buys sound,” sound was something he didn't know all that much about. “Sixth Stone” Ian Stewart, the band's piano man and roadie, said scathingly “He knows nothing about music whatsoever.” Experienced primarily as a publicist, the story goes that at the end of the session for their first single, he didn't realise the recording had to be mixed down to a final version, and reluctant to spend any more on studio time, he simply told the engineer, "You mix it, I'll drop by and pick it up in the morning!" 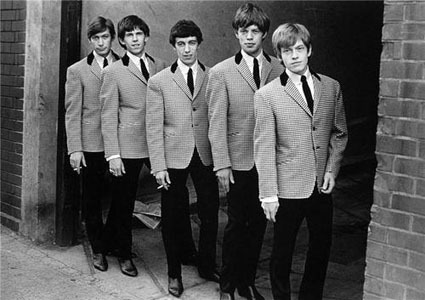 The band's other manger Eric Easton was working as an agent, and had no more studio savvy than Oldham, yet both of them are named as producers because they followed the advice of Phil Spector and made the Stones recordings independently, then leased them to Decca for release, allowing them to retain control of the master tapes. Trk 1) “Route 66.” This is given the same treatment as their version of Chuck Berry's “Come On,” that's to say, every hint of rumba is removed, and the accent is on a straight ahead Rock'n'Roll 4/4 beat. Handclaps are mixed well to the fore, and a warm bass and tight, economical drumming help drive the beat along, but the guitars are disappointingly thin and “pingy.” Nonetheless, this version of the song has become the template for British Blues bands, and can still be heard at gigs and jams even fifty years later. Trk 2) “I Just Want to Make Love to You.” The group approach Willie Dixon's song of seduction at breakneck speed, with an energy that would do credit to any punk rocker. Added maracas, claps and tambourine propel the insistent rhythm, but the guitars are still clangorous and Jagger's vocals seem thin and harsh. The performance would no doubt have raised the roof at Richmond's Crawdaddy Club, but its power is diluted here. Trk 3) “Honest I Do” is rendered as a fairly faithful copy of the Jimmy Reed original, even down to the unusually heavy cymbal strike that leads into the harmonica solo. Trk 4) “Mona (I Need You Baby. )” A mighty tremolo effect gives the guitar all the warmth and strength that have been missing so far. Credit should go to Brian Jones, of whom Bo Diddley once said, “He's the only white cat that ever got my rhythm.” The drums sound full and natural, the maracas add an authentic touch, and though the vocals are sometimes a bit far back in the mix, this cut comes across very well. Trk 5) “Now I've Got a Witness (Like Uncle Gene & Uncle Phil. )” Shortage of material and the presence of Gene Pitney and Phil Spector in the studio prompted this oddly-named 12-bar instrumental. There's some rather nice harmonica playing (reputedly Brian again) and Ian Stewart contributes some workmanlike organ, but there are no obvious avuncular additions, save those to the title. An effective “stocking filler,” but no more than that. Trk 1) “I'm A King Bee.” The Stones make a reasonably reverent reproduction of Slim Harpo's classic, and the sound's generally good, although the slide guitar's so painfully thin it's almost anorexic. Some years later, Jagger asked “What's the point of listening to us do 'I'm A King Bee' when you can listen to Slim Harpo doing it? " but most of the people buying this album in 1964 would never have heard of Slim Harpo if it hadn't been for the Rolling Stones. Trk 2) “Carol.” The band launch into this one with great gusto as Keef runs through all his best Chuck Berry licks, only faster than Chuck ever had to play them. Wyman's walking bass is warm, Charlie's snare is woody, and the handclaps on every beat give this version a restless insistence not possessed by the original. The band is bounding with energy. 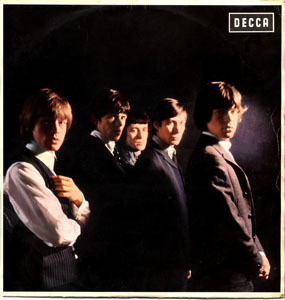 Trk 3) “Tell Me.” For the Stones to mirror the success of the Beatles it was necessary for them to write their own songs, and Oldham encouraged Mick & Keith to come up with some originals. Many of them weren't in the band's style, though they found favour with other artistes such as Gene Pitney (no. 7 with “That Girl Belongs To Yesterday”) or Marianne Faithfull ( no. 9 with “As Tears Go By.”) This one's a ballad in the Arthur Alexander mould (the band had recorded his “You Better Move On” on their first EP) and is tuneful enough, although the backing vocals are awfully ragged, and Keith's guitar is so high in the mix on the outro that it sounds out-of-place, strident, harsh and ugly. Bizzarely, some pressings of the LP were issued with a shorter, alternative version, a mistake that was rectified after the second try, and all subsequent pressings (matrix no. XARL6272-3A for those who really need to know) contained the “official” version, which lasts over four minutes, but stops abruptly instead of fading out like its predecessors. Trk 4) Bill and Charlie pump out the infectious beat of “Can I Get a Witness” as 'Stew' vamps chords on the piano. Guitars, harmonicas and maracas all take a back seat, leaving the sound warm and full. 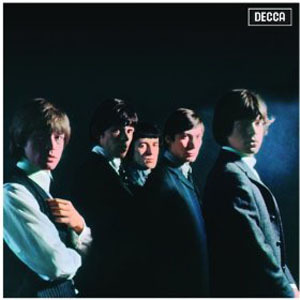 The backing vocals are tidier, possibly due to an uncredited injection of Hollies, and only Jagger's voice lets the track down, sounding especially strained on the chorus. Wyman's claims that Mick had to pop out and buy the sheet music suggest this may not have been a staple from their stage repertoire. Trk 5) “You Can Make It If You Try.” The band speed up this Solomon Burke Soul ballad, and excise the gospel-fused-with-country influences which makes the original so interesting. Ian provides organ of a less hymnal variety, and like “Witness,” it's played straight, with no frills or solos, rendering it, sadly, rather bland by comparison. 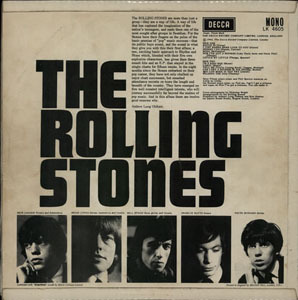 Trk 6) On “Walking The Dog” the Stones cut out Rufus Thomas's jokey intro, and the stops on the 7 th bar, but they keep the piercing whistles, and add the handclaps that seem to be de rigueur throughout the album. Recorded on the same session as “Carol” and “Route 66,” this surprisingly enduring version has become a standard at British Blues Jams, where its alternation between 12-bar and 16-bar verses confuses newcomers to this day. It would be unfair to suggest that the Rolling Stones' sound was a great deal worse than all other British bands of the day. Since the beginning of the Merseybeat phenomenon, British “beat groups” like The Undertakers and Kingsize Taylor & The Dominoes had been covering American R&B tracks, with varying degrees of sonic success. As Keith later commented, “Before we went to America it was very difficult to record in England. Nobody could record, or had recorded the sound we were trying to get. Everyone in England at the time was incapable: engineers, equipment, producers and, to a certain extent, musicians.” Still, a band with an experienced producer could have a distinct advantage. Listen, for instance, to the Beatles' 1963 LP track “Twist And Shout” made with George Martin, or The Animals' 1964 b-side, “Gonna Send You Back To Walker” recorded with Mickie Most, and you'll hear a difference in sound quality that leaves the Stones debut album standing. All the more remarkable, then, that it achieved such success and wielded such influence. If you want to chase up this classic album, be warned, it's either very hard to find or very costly. 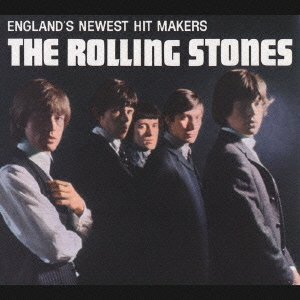 Often billed as The Rolling Stones (UK) on CD, import copies can cost up to around the £50 mark. More frequent and much cheaper is the CD of the US album version, England's Newest Hitmakers, but this replaces “Mona (I Need You Baby)” with the single, “Not Fade Away.” Alternatively, the original UK album is available as a cheap and cheerful mp3 download, which seems appropriate to its “low-fi” origins.